Free Docx to Doc Convert is a free solution that helps users open newer version of Microsoft Office (2007 onward) with their older Microsoft Office. Everyone today receives Microsoft documents in their emails as attachments, or download word documents from the internet for various reasons. However, users who do not have Microsoft Office 2007 or an above version installed will not be able to open and read these documents. The Free Docx to Doc Converter solves this issue, effortlessly. The Free Docx to Doc Converter is a very useful piece of software. Microsoft word files with the docx extensions do not open on computers that do not have Microsoft 2007 or above installed. The disadvantage with docx extension files is that they are not compatible with any versions of Microsoft word released before 2007. The Free Docx to Doc Converter easily converts any docx file to a doc extension file, making it universally readable. The Free Docx to Doc Converter software is incredibly easy to understand and use, even for novice users. The user just has to select the input files and specify the path to save the output files in. The software automatically remembers the destination folder, so the user does not need to mention it every time. Once the user has selected the input files, uploaded them and chosen the destination folder, they need to click on Convert. The process is very fast, usually a few seconds. However, this can take longer depending on the file size and the number of files. 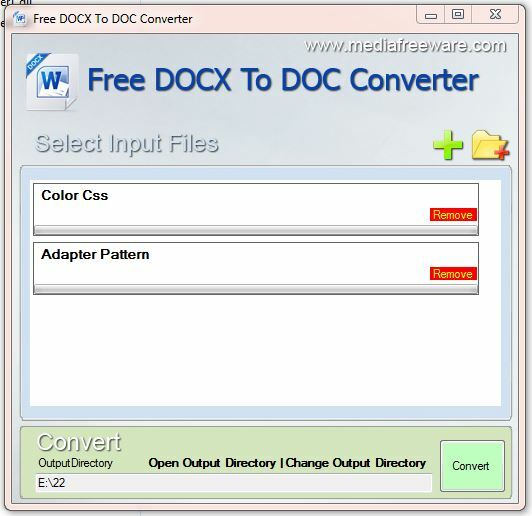 The Free Docx to Doc Converter can convert multiple docx extension files to doc at the same time. The user, however, has the option to stop processing of one particular file in the batch without having to disturb processing of other files. Once docx files are converted to doc extension files, they can be opened and edited on any computer irrespective of the version of Microsoft Word installed on the computer.